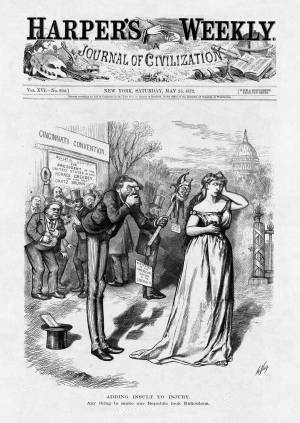 The surprising result of the Cincinnati Convention-the presidential nomination of Horace Greeley-is interpreted by Thomas Nast in this Harper's Weekly cover as an insult to the nation. A snickering Senator Carl Schurz presents to an offended Columbia the scepter of power, which is actually a jester's stick with Greeley's head where the orb should be. Other symbols of national authority are the Capitol Building in the right-background and the fasces (ax in a bundle of rods) on the fence surrounding the Capitol. (Fasces were carried by Ancient Roman magistrates to signify their power.) The epithet "adding insult to injury" derives from a first century (CE) Greek fable by Phaedrus. A fly bites the pate of a bald man, who forcefully slaps his own head in retaliation. The fly responds: "You wanted to revenge the sting of a tiny insect with death; what will you do to yourself, who have added insult to injury?"